This Harissa lamb dish is one of a deepest and most divine tasting dishes I have ever made. Also, it is a great balance of protein, smart carbs, vegetables and healthy fats. If you like a bit of spice and chilli with a great lemony flavour you will be totally satisfying. 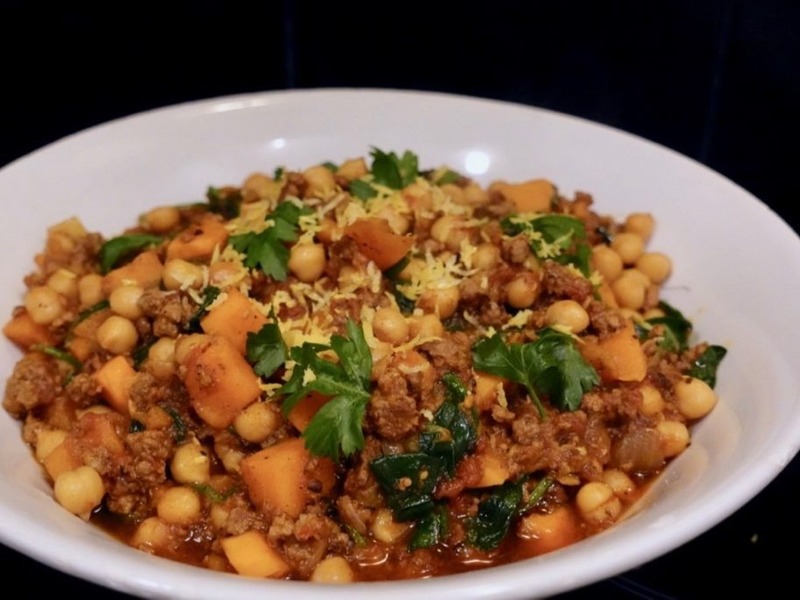 A satisfying meal with lamb, sweet potato, chickpeas and Kale. I have bought diced lamb for a slow-cooked dish but got home too late. I had some chickpeas just activated and ready to use or freeze for later. To still get dinner within an hour I got the chickpeas straight on to cook and minced the lamb to make it all quick and easy. Add activated or sprouted chickpeas to a pot, bring to the boil, then simmer 45 minutes. In a Dutch oven or large pot, heat the oil. Cook the onion over medium-high heat about 5 minutes or until soft. Push the onions to the sides of the pot and add the lamb mince. Cook the meat, breaking apart with the spatula, until nicely brown, about 5 minutes. Add the garlic, harissa (add more if you like spicy chili), paprika, and salt. Cook another 1 minute until the spices are fragrant. Pour in the tomatoes and simmer for 15 minutes to reduce the liquid. Add the sweet potato and the stock, bring to the boil, then reduce and cook another 15 minutes. Remove and strain the Chickpeas form the other cooking pot. Add to the Harrissa with the Kale. Bring to the boil, reduce to low and cook another 15 minutes or until the sweet potato and chickpeas are tender and the harrias thickens. Remove from the heat, stir in the lemon juice and lemon zest. Season with additional salt if needed.